The formalities involved in opening a bank account in Saudi Arabia are quite stringent and involve a considerable amount of paperwork. It’s mandatory to have a residence visa, which demonstrates your right to be in the country. You also require a ‘letter of no objection’ or a ‘no objection certificate’ (NOC) from your employer. The employer’s letter needs to stipulate your salary, to show the amount that will regularly be paid into the bank. Some banks will ask to see your tenancy agreement to establish your residential address, and most will ask for a photocopy of your passport. You should take copies of all these documents, as well as identity photographs. A worker’s dependants (e.g. wife and family) can open an account with his permission, as he’s in effect their sponsor. When moving to Saudi Arabia to live and work, it’s unlikely that you will close your bank account at home, particularly if you still have payments to make to cover commitments in your home country. In order to limit your tax liabilities there, however, the funds going into home accounts should be kept to a minimum. It’s almost certain that you will also open an offshore bank account. Cash is preferred for everyday transactions in Saudi Arabia, where people are generally suspicious of cheques. In fact, although utilities companies and other major service providers accept personal cheques for regular payments, these are most unlikely to be accepted by local retailers, as they carry no guarantee of payment, even though issuing a cheque without the necessary funds in your account is a criminal offence in the region. Most current accounts are therefore not cheque accounts, although these are also available. All the standard banking services are offered by Saudi Arabian banks, including cheque clearance, standing orders, direct debits and credit card repayments. A certain number of transactions per year are usually free, after which there might be a charge levied, usually at the discretion of the bank manager. Charges vary between banks, as they do in other countries, so shop around before opening an account with a particular bank. Cash dispenser cards are issued as a matter of routine, with the standard security measure of personal identification numbers (PIN) to allow access to your money through ATMs. Personal credit and charge cards, most of them underwritten by Visa or Mastercard, might also be issued by a bank, but these must be negotiated with your banker and often have spending restrictions. It might be in your interest to open an account with your employer’s bank: favourable terms might be offered for group accounts and your salary might be accessible more quickly if the accounts are in the same system. If you wish to change bank, it pays to be honest and close your account instead of leaving a small amount in it to keep it active, as you’re likely to incur charges. Current accounts pay little or no interest on account balances and, if they do, you must usually have a substantial balance to qualify. 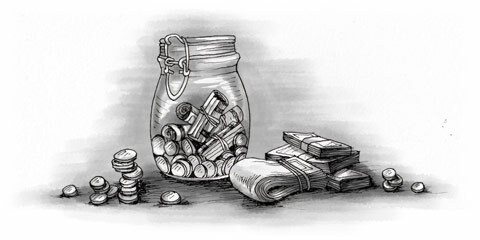 It’s better to keep surplus funds in a savings or deposit account. The information shown on personal cheques is fairly standard (i.e. the name of the bank, the branch, your name(s), the date, etc. ), and the layout of cheques is similar to UK or American cheques. The recipient’s name is written on the top line, the amount written in words on the following line and the amount in figures entered in the adjacent box. You sign the cheque on the line at the bottom. An important point to remember is that Arab names are very similar, especially in their diminutive form, so you should be sure to write the full name of an Arab recipient. You aren’t entitled to reimbursement for a ‘misdirected’ cheque if you’ve been careless and inaccurate when writing it, although banks are responsible if they’ve honoured a cheque which doesn’t bear your proper signature. Cheques are available for completion in English or in Arabic (which is read and written from right to left), and bank statements and correspondence can be provided in either language (your bank should use the appropriate language automatically). The business language of the region is English, and you should encounter no difficulties if you can communicate in Arabic or English. Both crossed and uncrossed cheques are available. Crossed cheques (marked ‘A/C Payee Only’ at 45 degrees across it) can be paid only into the payee’s account and are therefore safer. An uncrossed cheque can be paid into any account, although the bearer is normally asked to endorse the back of the cheque. To ensure that a cheque can only be paid into the account of the payee, you must add the words ‘A/C Payee Only’ between the crossed diagonal lines on the cheque. Uncrossed cheques made out to ‘Bearer’ or ‘Cash’ are treated as currency and can be cashed by anyone. You should never overdraw your bank account unless you have authorisation from the bank. If you do so and the sum is small, your bank might pay the amount and inform you of the shortfall, or they might pay only the amount held in your account, or they might not honour the cheque at all. The last is unlikely, unless you’re a new customer or have a poor record with the bank. In most cases of an unauthorised overdraft, you will incur a substantial charge and be questioned about the incident. Note that issuing a cheque without the necessary funds in your account is a serious criminal offence in the region and the police will be notified at the discretion of the bank (or creditor) concerned. Prosecution isn’t uncommon and punishments can be harsh. A large transient expatriate population means that financial abuses aren’t uncommon, and the banks protect their interests carefully, with the support of the judicial system. It’s important to understand that, in the case of serious financial difficulties, expatriates are unlikely to receive much in the way of sympathy and understanding, since their services in the country are viewed as expendable. In cases of criminal financial actions, penalties are likely to be harsh and might involve confinement for indeterminate periods while the judicial process takes its tortuous course, especially in the more conservative states. If your cheque book is lost or stolen, you must notify your bank by telephone immediately and confirm the conversation in writing. Once you’ve informed the bank of the loss, any cheques written after that point cease to be your responsibility. It’s possible to stop payment of a cheque, but you must be in a position to persuade the banking administration that the cause is genuine and pressing. When buying a major item such as a car on credit, the bank funding the loan is likely to issue you with a series of post-dated monthly cheques, to be passed to the vendor, who will present the cheques on the appropriate dates for settlement. You should ensure that the cheques are correct in every detail and that you keep any receipts issued. Make sure also that there are sufficient funds in your account to meet the payments. If you’re unable to meet a payment, you must notify your bank in advance to make an appropriate arrangement. Banks are usually helpful in such cases (as no bank wants to acquire second-hand cars in default of payment). In the case of a motor vehicle purchase, the official registration of the vehicle might show the bank as the official owner until the loan has been repaid in full. For utility bills, direct debits can be arranged with your bank to cover regular payments, but make sure that you check your statements to ensure that these instructions are being carried out. Alternatively, you can pay utility bills in cash at any bank, irrespective of whether you have an account there. You can of course pay cheques drawn on foreign banks in major currencies into your local account. You might be credited with the amount straight away, but some banks wait for clearance, which can be a lengthy process. If you’re expecting regular payments of this kind, check whether your local bank has correspondent status with the foreign bank involved, which will precipitate payments. If not, you might need to find a quicker method of being credited with the money. You can open a savings or deposit account with any retail bank in Saudi Arabia. There are no specific savings banks such as thrifts or S&Ls in the USA or building societies or ‘mutual companies’ in the UK. Although savings accounts offer lower interest rates than deposit accounts, they have the advantage of easy withdrawal at any time. Savings account holders might receive a passbook in which financial transactions can be recorded, but more usually a monthly statement is issued in order to record the progress and details of the account. Holders might also be issued with a cash card for use in ATMs, a cheque book and a credit card, depending on the type of account. There are many types of deposit account available, offering varying rates of interest according to the amount on deposit and minimum deposit period. This is usually a month, although some banks pay interest after a week – generally on large amounts only. High interest accounts are available but require substantial amounts to be deposited in order to qualify for the higher levels of interest. Some banks offer standing order facilities with these accounts and issue cheque books, but there might be maintenance charges and a limit on the number of cheques that can be issued annually. In many banks, you can open savings accounts designed for major foreign currencies, predominantly US$ and GB£. Most expatriates, however, wish to export the majority of their income to accounts outside the region.